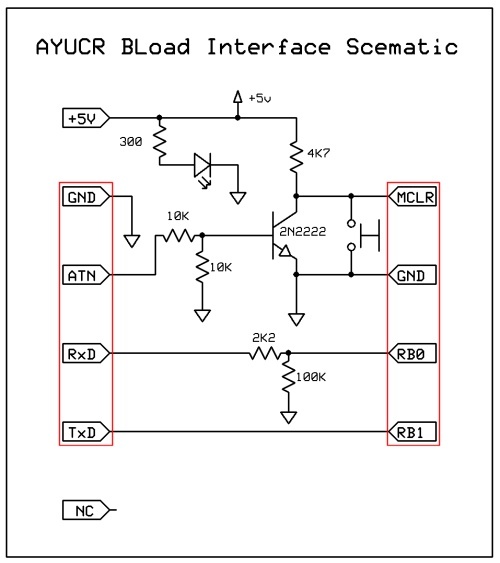 The BLoad Interface Adapter provides a serial interface between a PIC 16F819 microcontroller and a host system via a standard RS232 serial port. The 4 wire interface includes standard send and receive lines as well as remote reset via the DTR line. There is an LED power indicator and manual reset button. Both are optional but handy. It is built using surface mount components but is still something a hobbyist can build using a fine point soldering iron and a steady hand. This article includes a parts list, circuit board layout and instructions for building your own. I chose SMT to keep the part small so it wouldn't get in the way and block too much of the proto board. It's certainly possible to implement the adapter using conventional through-hole parts for those who are uncomfortable with soldering small parts. Since the adapeter is designed to plug into a proto board you may also just build the circuit on the board itself and get identical functionality. The adapter simply provides a convenient implementation of a commonly used circuit that can be quickly dropped into a circuit and moved from one board to another. 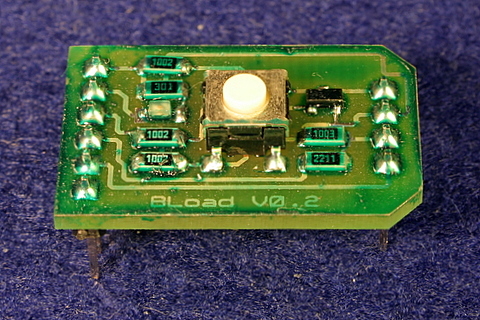 The adapter has two headers, one on each side of the board. The left-hand header interfaces with the host. The center 4 pins are for the 4 pin serial cable. There is also a pin for +5V. The right-hand header interfaces with the PIC being programmed. Typically pins 4 through 7. Also shown are a power indicator LED and a momentary push-button for use as a manual reset switch. These parts are handy but strictly optional. The image below is a reverse image board layout at 600dpi. If you require positive art you can flip the image but it is important to preserve the 600dpi ressolution. Construction is straight-forward. Do all the surface mount parts first so that the board lays flat while you work. You can use the picture at the top of this page for part placement. The Cathode of the LED faces left. Once the surface mount parts are in place solder the 4 and 6 pin headers to the board. Good solder joints will ensure the part is durable enough for repeated insertions and extarctions from the protoboard. Note the green "conformal coating" on the board in the top photograph. This is simply Testors 1601 Transparent Candy Emerald Green Enamel. Mask off the LED and the button and spray three light coats about 30 minutes apart. It helps protect the solder joings and gives the finished product a professional look. Once the adapter is built it's time to test it out. First you must have a protoboard with the proper terminal spacing. The adapter is designed to bridge 2 5-terminal columns with a power and ground strip in between as in the picture below. The adapter has two sides, the 6 pin host side where the serial cable plugs in and the 4 pin target side which connects to the PIC 16F819. For everything to work it must be lined up properly and the proper power and ground connections made. Let's walk through the steps. As you do refer to the two photos below. First decide where the PIC 16F819 itself will be located. Made sure the notch is facing up. 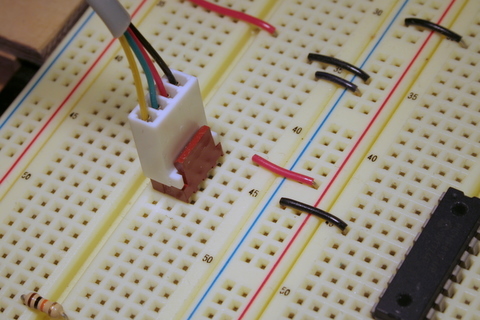 Make a connection to +5V to pin 14 (middle pin right side) and ground to pin 5 (middle pin left side. Plug in the adapter so that the target side 4 pins connect to pins 4 through 7 on the PIC 16F819. You are plugging it in over the ground wire. Plug the serial cable into the protoboard liningn it up to connect to pins 2 through 5 on the adapter. This is the middle 4 pins. Now that the connections are aligned temporarily remove the adapter in order to make the connection for +5V. This wire connects to pin 1 under the host side of the adapter. Notice it does not connect to any of the seial port pins. Replace the adapter in the same location. Once the adapter is connected apply power to the protoboard and check that the led power indicator on the adapter lights. If not disconnect the power and check your connections. If so the adapter is powered and should be holding the MCLR line on the PIC 16F819 high allowing it to operate. For anything useful to happen at this point the PIC 16F819 must be preprogrammed with firmware that adheres to the BLoad Framework. Assuming the chip is programmed with the blink.asm firmware you can connect an LED to pin 18 of the PIC and it should be blinking. 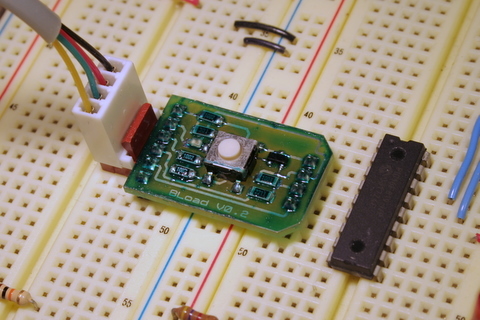 If the chip is blank you will need to program a first time with firmware that includes the bootloader. Pushing the reset button on the adapter resets the chip. With the serial cable attached the PIC should respond to commands from the bootloader driver too. I might be able to offer these for sale if enough people show interest. The cost would be about $20 assembled. Drop me a line if you are interested. last modified: December 31 1969 19:00:00.